An important item to understand about channels in Photoshop Elements 11 is bit depth. A bit holds one of two values; one value is for black, the other for white. When you have 256 levels of gray, you’re working with an 8-bit-per-channel image — 8 bits with 2 possible values each is 28, or 256, possible levels of gray. Multiply 8 bits per channel times your 3 channels, and you get 24 bits, which is the common bit depth of images you print on your desktop printer. Now take a look at the Image→Mode menu. You should see a menu selection that says 8 Bits/Channel, as shown. When you open an image in Elements, if this menu command is grayed out, it means you’re working with a 24-bit image — an image of 8 bits per channel. Using a scanner, you can scan a photo at 16 bits per channel. When you do, you end up with many more levels of gray. When you take a picture with a quality digital camera, you can capture 32-bit-per-channel images, and you end up with a file containing more than 4 billion levels of gray. That’s a lot! If you attempt to adjust brightness, contrast, or other image enhancements in an 8-bit-per-channel image, you often destroy some data. You can cause some noticeable image degradation if you move adjustment sliders too far while working with 8-bit-per-channel images. 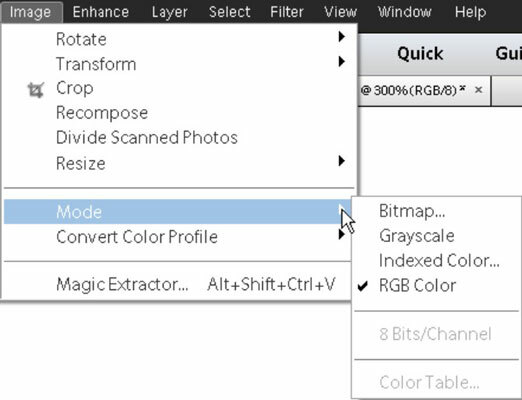 When you edit your 16-bit and 32-bit images, you don’t destroy data — you simply inform Elements which 256 levels of gray (of the total number available) you want to use. The result is an image with more continuous gray tones than you can achieve in 8-bit-per-channel images.